Hundreds of StingRay Parts Washers are used in diesel engine remanufacturing applications especially for Cat Diesel Engines. The original parts washer design considerations and machine sizes were designed around Cat engine blocks and transmissions. The StingRay heavy duty construction coupled with high power density and the power wash process are particularly suited for Cat diesel engine cleaning. Short 15 minute wash, rinse and dry cycles are typical. A rinse system with an injector pump applies rust inhibitor into the heated rise water to prevent flush rusting of iron and steel parts. The unique oscillating solution delivery system directs the blasted hot solution at different angles of attack on each rotation of the non-synchronous turntable. The simplex and duplex high power pumping systems delivery the required impact energy to remove tough soils like oil, grease, road soils, burnt hydrocarbons, paint and carbon. Before and after photos of diesel engine components cleaned in a StingRay are shown below. Pre-cleaning Diesel Engines prior to tear down helps simplify disassembly as all components are clean and bolts and nuts are easier to access. The tear down plant area stays cleaner making the whole plant cleaner with a short 10 minute pre-wash. Click on the diesel engine cleaning photo for a larger view before cleaning and after cleaning. Diesel Engine Block washed in StingRay Industrial Parts Washer. "Click image for larger view." Removing Oil Pan cleans internal in Pre-wash of diesel Engine. "Click image for larger view." Cat 3406 Prewash in SR8473 Parts Washer with mult-metal safe Pre-clean III. "Click image for larger view." The prewash diesel engine fuel system photo in a StingRay Parts Washer shows the before and after results of a 15 minute cleaning cycle in a aluminum safe chemical with 5% concentration, 180 degree wash temperature and 70hp pumping system in a StingRay SR8473 diesel engine parts washer .Click on the diesel engine cleaning photo for a larger view of the before-cleaning and after-cleaning results. Cat Diesel Engine Fuel System Prewash Results in a StingRay 8473 Parts Washer. "Click image for larger view." Cat Diesel Engine blocks, crankshaft and other engine components are easily cleaned in our parts washers. 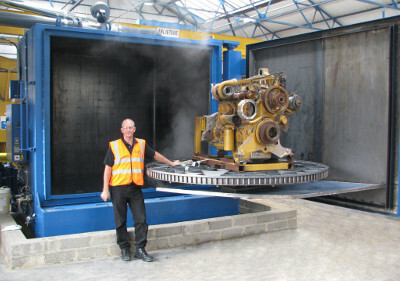 The machine size is selected for the largest size engine cleaned. The SHIM manifold system increases impact energy and power density for cleaning shorter wash loads and baskets of component parts. Shown are the results of a diesel engine block before and after a 15 minute wash cycle using Power Kleen I detergent. Machine size is a StingRay SR 5275 Parts Washer. Click photo for a larger view. The StingRay SR10073 in a Cat diesel engine remanufacturing shop after pre-washing is shown on the right. The engine is then disassembled and all component parts cleaned in baskets for inspection prior to reassembly. This size StingRay washer has the load capacity to wash a much larger engine block laying horizontal. The rust inhibitor injector system eliminated the manual labor of rust proofing the parts after washing. With the high wash temperature the parts flash dried in several minutes after the door was opened. Cat Diesel Engine block before and after wash. "Click image for larger view." Cat 3406 Diesel Engine Pre-wash in a StingRay 10073 Parts Washer.